I will fully admit that my own relationship with lace is a bit shaky. It’s not a technical problem — I can follow the charts, make all the stitches, and read the directions. I know where to place my stitch markers and how to be careful with a double yarn over. Even the delicate weight of the yarn, the small needles and blocking aren’t my issue. So why, whenever I cast on a lace project, do I find myself hopelessly muddled, or plodding along happily only to find that my counts come out all wrong? Some part of it for me is definitely related to patience. Primarily a sweater knitter, I tend to prefer large swathes of endless stockinette, broken up by interesting construction — the turn of a collar, the quick development of a sleeve in comparison. I like to be able to put on a movie and knit for an hour or two without thinking too hard. Lace doesn’t always allow you to do that. Lace patterns require more attention, a more intimate relationship with your project and materials. There’s something special about that. You gather up your pattern, your tools (highlighter, stitch markers, pencil, row counter.) You sit down and read through, then begin to follow the directions. It’s meditative, and absorbing, and at the end, your finished piece is a show-stopper. I can’t think of too many things that are potentially more rewarding than a beautiful piece of lace. For some knitters, the frustration of lace is related to the materials — tiny needles and tiny yarn. If this is a common problem for you, give the same pattern a try with a more comfortable weight of yarn. Most lace patterns scale up easily (especially scarves, shawls, and stoles.) This makes another common challenge — wrong-side lace knitting — a little easier to tackle, too. I’m sure I’m not alone in feeling a little lost when it comes to the concentration and attentiveness portion of lace knitting, and that’s okay. I’ll let you in on a not-so-secret “secret” — practice is key. 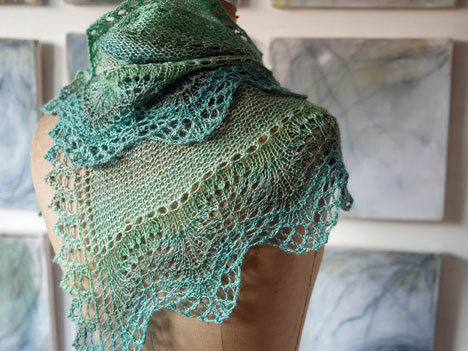 Luckily, we’re not alone in needing practice, either, and the Ongoing Lace KAL in our Ravelry group might be just the place — and the pace — you need to get going on your next lace project. 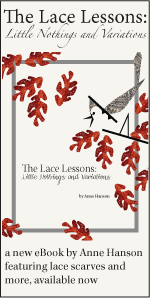 To make your selection simple, we’ve gathered up all of Anne’s amazing lace patterns into one bundle. Join us with your projects in this group and on Instagram, and tackle something new along with your sweater knitting this Fall. 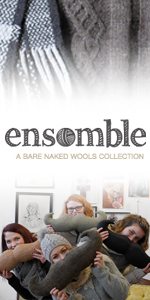 Even better, knit lace in it’s most beautiful format with some of our favorite lace yarns from Bare Naked Wools. The colors are beautiful, timeless, and it’s easy to follow a pattern in a natural neutral that doesn’t make your head hurt. Which shawl patten is in the picture and what yarn was used. Absolutely beautiful! is that the “See the Sea” shawl pattern? I would also like to know which yarn/color was used? It’s gorgeous! I have somewhat the opposite problem… I love the attention that lace requires and the meditative focus that happens as I repeat the pattern repeats silently in my head like a mantra. But a sweater is a plod. Long and slow… I get impatient with it. And, as Bonnie says, the stakes seem higher as fit is so important.